After a stop-start beginning to the cricket season, Waringstown’s Premier League campaign reaches a crucial period over the next four days. Lee Nelson’s men face three matches between Thursday and Sunday, starting with a trip to Carrickfergus in a rearranged Twenty20 fixture. 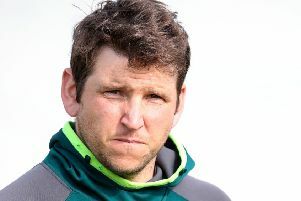 The villagers will be without opening batsman James Hall and fast bowler Phil Eaglestone at Carrick, in a game that has previously been rained off twice. A further washout would lead to a no result. Waringstown then face a league double-header against Civil Service North and champions Instonians over the weekend. First up CSNI, the Challenge Cup holders, visit The Lawn on Saturday. A trip to Shaw’s Bridge to face Instonians follows on Sunday. David Dawson is unavailable because of holidays and while wicketkeeper Jonathan Bushe can play on Saturday, he is not available for Sunday. Nelson said: “It’s been a frustrating start to the season because of the weather, so this is an important spell for us. “I’ve been pleased with the cricket that we have played. We’ve got into the next round of the Challenge Cup, Irish Cup and the Twenty20 but we haven’t managed to get a game in the league yet. Lurgan are in action on Saturday, Peter Haire’s men travelling to Upritchard Park to face Bangor.